Trimming is required for models equipped with the optional SubWoofer. The Liner is marked for this trim. WeatherTech Cargo Liners provide complete trunk and cargo area protection. Our Cargo Liners are digitally designed to fit your 2008 Mazda CX-9 and feature a raised lip to keep spills, dirt and grease off your vehicle’s interior, protecting your investment from normal wear and tear. The cargo liner fits perfectly. I love how the liner covers the third row when the seat is folded flat. However, when I need to use the 3rd row seat I love how the cargo liner detaches leaving the part of the liner that covers the trunk area. The fit and finish are truly excellent. Thanks for your quick shipping and great product. I searched all over the internet for just the "right" cargo liner for my special new car and was impressed by the comments I had read about WeatherTech. The price was great, it installed in a minute and looks like it came with the car. I recently took my car by the dealer and I showed one of the service techs my liner. He called several associates over, including his boss to recommend that the dealership use this liner instead of their current style. One of the salesmen, who has the same model as mine, made me go to the computer to show him the website so he could order one for himself. I was extremely proud that I showed them what I had found. THANKS! When I bought my new SUV Mazda CX-9 last month, I was looking for Cargo Mat. Mazda doesn't offer any all season cargo mat which can cover the trunk area as well as third row seat. 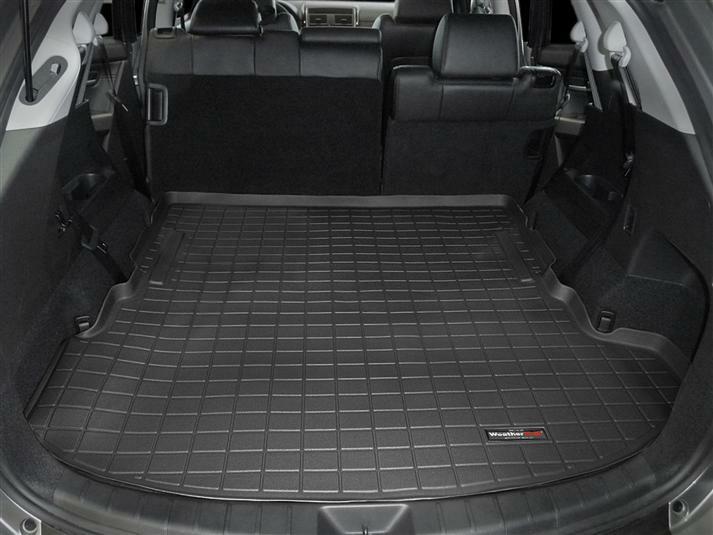 I was looking around on web, when I found about Weathertech custom made cargo mat. As soon as I saw I wanted to buy it and ordered online. I received the mat in the promised time frame and Voila!! it comes custom designed specifically for CX-9 which can fit over the whole trunk and third row seat. I really liked that it comes in two pieces which snap together, so in case if I have 3rd row seat up I can still use the other piece for trunk area. I am extremely happy with the product and will shop more in future for more accessories. Great fit on this Cargo All Weather Liner. Had one in my 2013 CX-9 and learned I could not do without one in my new 2016 CX-9 Signature.